Chinese astronaut Zhai Zhigang waves from outside his Shenzhou 7 spacecraft September 27, 2008. He became his country's first spacewalker. A Chinese astronaut has completed his nation's first everforay into space beyond the confines of a spacecraft. Zhai Zhigang, the lead Chinese astronaut, or taikonaut, ofthe Shenzhou 7 mission, spent about 20 minutes floating outside his vehicle.During the spacewalk, which began at about 4:40 a.m. ET (0840 GMT) and ended at4:58 (0858 GMT), he retrieved a small sample of solid lubricant from theoutside of thespacecraft that had been placed there before launch. The excursion was broadcast live. Zhai, along with crewmates Liu Boming and Jing Haipeng, launchedinto space Thursday aboard a Long March 2F rocket from Jiuquan SatelliteLaunch Center in China's Gansu province. The mission is China's thirdmanned spaceflight. To begin the spacewalk, Zhai exited from the hatch in thede-pressurized orbital module. ?I have been out of the hatch, I?m feeling good,? Zhai saidimmediately after stepping out, according to the CCTV official Chinesetelevision announcer?s translation. ?To all the people in my country and theworld, my greetings. My country, please have faith in me. My team will finishthis mission.? He proudly waved the red flag of the People?s Republic ofChina in space to mark the achievement. 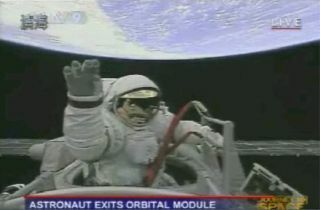 Liu assisted from inside the orbital module, clad in aRussian-made Orlan spacesuit and occasionally peeking his head out of the hatchto hand Zhai materials. Jing spent the duration in the pressurized re-entrymodule, which is due to eventually carry thetaikonauts home. In short order, Zhai had retrieved the test sample from thespacecraft?s hull and passed it back inside to Liu. After about 20 minutes hestepped back inside the spacecraft feet first, and the two taikonauts closedthe hatch. Successfully completing a spacewalk solidifies China'sstatus as a space power, and helps the nation move toward its goalof establishing a more permanent presence in space. "We?re probably looking at an effort to do a manneddocking [in the future] and eventually a spacelab," said Dean Cheng, Chinaanalyst with Alexandria, Va.-based think tank CNA Corp. "This is part ofthe progression toward that end. And if the Chinese really are intending to puta man on the moon, then this becomes even more essential." In addition to proving China's ability to maneuver in space,the spacewalk showed that China can produce reliable and safe space equipment.During his space venture, Zhai wore a new Chinese-built spacesuit, dubbed Feitian(Chinese for "fly the sky"). The suit, which reportedly cost 30 million yuan (about $4.4million), did its job protecting Zhai from the harsh temperatures and radiationof space. It has 10 layers of insulation, weighs about 265 pounds (120 kg), andtakes up to 15 hours to assemble and put on, the official Chinese news agency Xinhuareported. Another important feature of the spacewalk was the fact thatit was broadcast live, which represents not only China's technological prowess,but its growing confidence and increasing efforts at transparency. "They are opening up," Cheng told SPACE.com. "Perhapsone of the lessons from the Olympics is that good things come from being open." The Shenzhou 7 mission is scheduled to come back to EarthSunday.